I swear to you, I did not doctor this photo. Returning from Colorado last week, we drove the entire length of the panhandle of Oklahoma–it’s beautiful and very remote country. And passing by a gas station in a little town, Hubs simultaneously slammed on the brakes, nearly threw the camera at me, and said, "You have GOT to take a picture of this for your blog." What to drive to save on gas. I’m not too good at this caption thing. Great shot, though! Horse: Does any one know what century this is? My master went in for a drink at the saloon, and I’m still here trying to figure out where in the world I am! Dale’s Stop-N-Git. Beer, Wine, Milk, Bread and Hay. Git it while you can. Cowboys have to go, too. Now that’s a one-horse town. Gworsh, Wilbur, you’ve been in there long enough to get all the apples and sugar cubes they have. Do they carry salt licks? Ranch Hand Randy teaches old Trigger how to save his parking spot when there’s a rush at the EZ Mart. For methane, pull up behind Trigger. Now that’s a one-horse mart! The pump goes in where? I couldn’t do anything but laugh!!! K, anyone who has ever taken a nose-to-tail trail ride KNOWS that horses do not need to purchase gas. They already have plenty. I do believe that’s retro for hybrid! Man……I must really be from the sticks. I was looking for something really unusual. It took reading the suggestions to realize it was all about the horse! Never mind. Carry on. Y’all. If one more parent tries to stick a quarter in my slot, I’m gonna have to tail whip ’em. You know, people in New York think everyone in TX and OK ride horses to the store. Is it a sterotype if it’s true? Cowboy: Regular or unleaded today? Horse: Give me the hard stuff. Nobody else rides a horse anymore?? what? Last week, one of the kids was delivered to summer reading program at the library, on a horse. This is what happens when you put your mart before your horse. Maybe he was double parked. Ugh, that bathroom was GROSS! I couldn’t think of anything witty either, but I’ll vote for the ‘quarter in my slot’ one!! Too funny! Looks like our town!! Okay, it’s early, and all the good ones were taken. Great pic! Even a cowboy needs a Big Gulp! I don’t have a caption but I can say that I am seriously not surprised by this sight at all! I could say more but some may be offended! What’s the problem with this picture??? Welcome to Rural America! Well, YEE HAW! That’s too funny. Do ya wanna fill’er up? But this reminds me of the local tavern in the Wisconsin town where I grew up, parking lot filled with snowmobiles and perhaps one errant truck. Transportation is transportation! We don’t care how you git here, folks, just git here. Two things that horses don’t need: gas to keep them going and a gas station to make them pee. That’s too funny; reminds me of the town I got married in. I so would have loved to see something like this! You call that horse power? Just love that you captured that photo!! So funny!! Diatribals comment about Stop N Git reminded me of that. 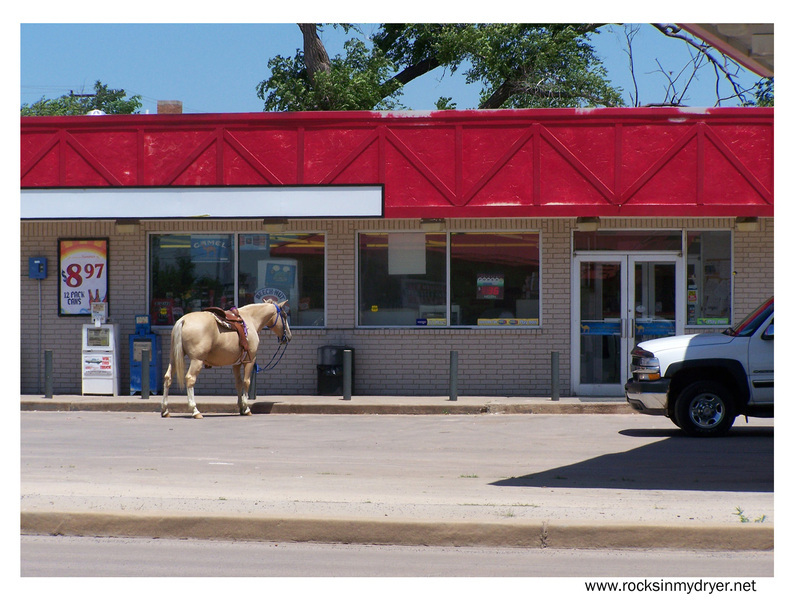 Just another day at the Pony Express Mart. Just lift your tail, there’s gas for sale! I don’t have a caption, but it DID occur to me that you have a very loving husband who is concerned about your blog material! What a guy!!! Thanks for the great laugh – even hubs enjoyed that one! 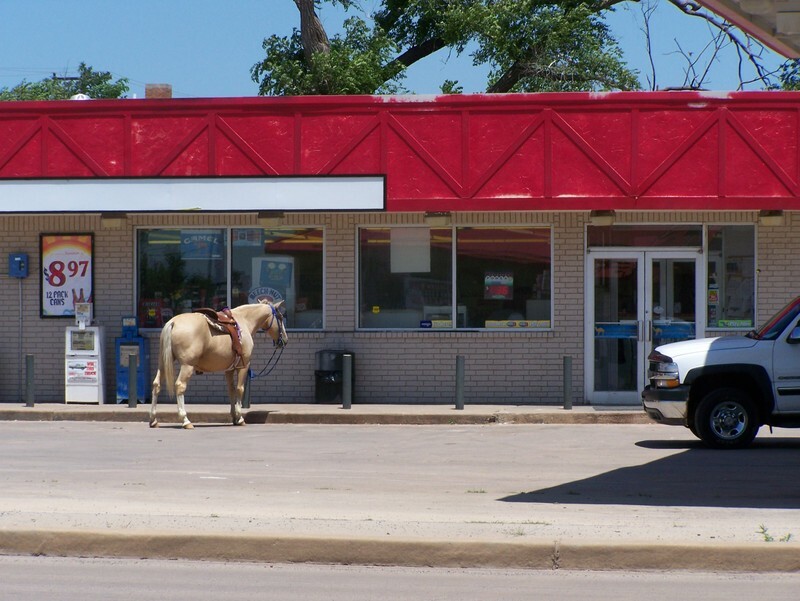 You can lead a horse to a slurpee machine, but you can’t make him drink. I can’t get passed the fact that you are now liked with http://www.rocksinmydryer.net — and you never.said.anything!!! Who cares about the gas station … I was thinking about rocksinmydryer.com, and how another company has it, and oh… I was mourning the fact that you just HAD to have your own URL, and voila! You do! Awesome. Hey, a horse in a gas station’s parking lot’s gotta do what a horse in a gas station’s parking lot’s gotta do. Was that taken in Bluejacket, Oklahoma? It sure looks familiar! And I just might recognize the horse, too. Looks like one that the ‘professional cowboys’ had when they came to my in-laws’ ranch to work cattle! Love that golden palomino color!